Institute for Health Metrics and Evaluation (IHME) and Public Health Foundation of India (PHFI). 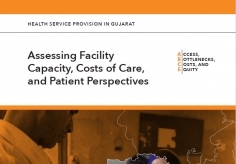 Health Service Provision in Madhya Pradesh: Assessing Facility Capacity, Costs of Care, and Patient Perspectives. Seattle, WA: IHME and PHFI, 2018. The Access, Bottlenecks, Costs, and Equity (ABCE) project aims to collect and generate the evidence base for improving the cost-effectiveness and equity of health systems.